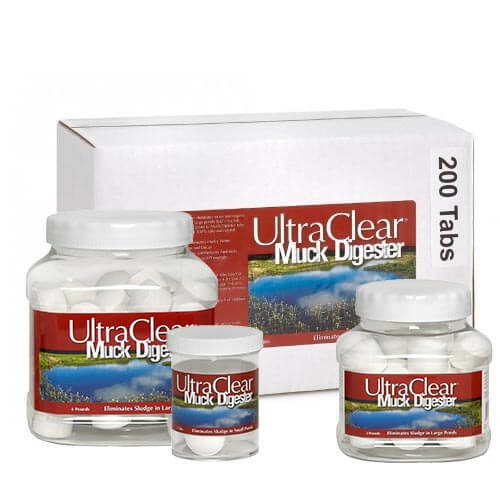 Eliminates organic sediment (muck) on pond bottom. Reduces sludge build-up from organic decay. Breaks down & eliminates animal waste. Eliminates murky water from organic decay. Reduces undesirable odor from decay. Reduces toxic ammonia from pond water. Lowers problem causing nitrate and phosphate. Can be used in cold weather or anytime of the year. Safe for all fish & wild life using pond. Can be used with all UltraClear products. Dosage Rates are based on pond or lake volume. Standard dosage is every 4 weeks except for problem ponds. For problem ponds, dose every two weeks. Large ponds & lakes: use 64 tabs per one surface acre every 4 weeks. Assumes an average depth of 4 feet. A four pound jar contains 64 tabs and will treat a one surface acre pond or lake for one application. Medium size ponds: Use 16 tabs per quarter acre surface area every 2-4 weeks. Assumes average depth of 4 feet. A 2 pound jar will treat a half acre pond or lake for one application or a quarter acre pond for two applications. Small decorative ponds: Use the convenient 6 tab jar for ponds under a thousand gallons.